My trio of nutritionist don’t agree on eating beef on my restricted diet. The first told me straight out to eat vegetarian, which I do not want to do. The other two were more understanding and suggested limiting beef intake to six ounces a week and finding the leanest beef possible. For me, six ounces is one serving, even though for nutritionists, it’s two. So I’ve bought some six-ounce fillets as a weekly treat. But I also love hamburgers and wanted a way to continue eating those. Hamburgers you eat out can range from 75 percent to 80 percent lean, which means they’re 25 to 20 percent fat. That’s not doable for me, so I’ve cut out McDonald’s, Wendy’s and White Castle burgers. 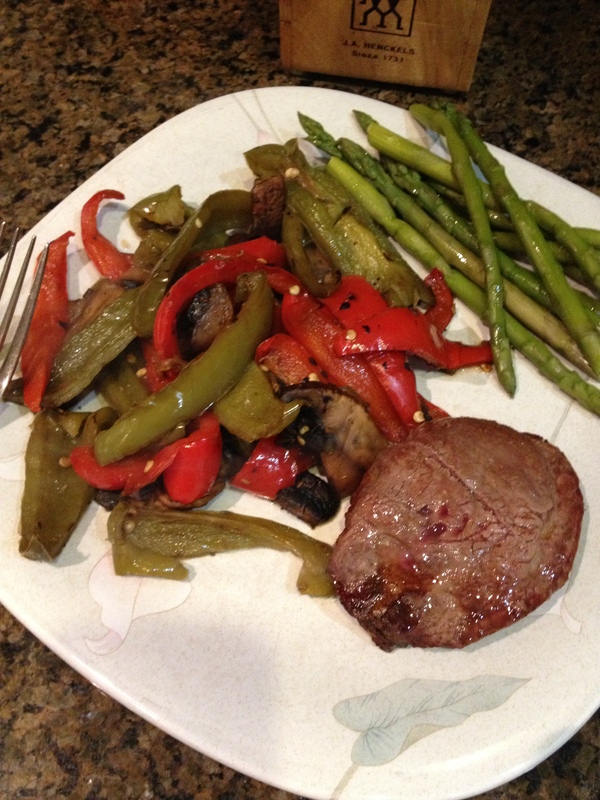 A lean burger, along with peppers and asparagus. At home, I had been buying 90 percent lean ground beef, thinking it was the leanest available. But as I’ve scouted my local stores with the new eyes of someone on a no-salt, no-fat, no-sugar diet, I discovered that one Chicago supermarket, Jewel, sells a leaner ground beef, 96% lean in fact. It’s the most expensive of course, as healthy items invariably are, but I’m paying the price to keep hamburgers in my life. I buy packages a bit over a pound to make four burgers and freeze them for future use. My first nutritionist, the nutrition nazi as I call her, said the only type of hamburger bun I can eat is something called an Ezekiel bread bun, available frozen only at Whole Foods in my area. “Ezekiel Bread is a type of bread that is made from wheat, barley, beans, millet, spelt, and lentils. It is called Ezekiel bread because the recipe comes from the book of Ezekiel in the Hebrew Bible,” says Ask.com. A vegetarian I had worked with loves it. To me, it tastes like gravel in bread form. My wife likes it even less, but I’m dealing with it so I can have my hamburger. Regular ketchup is out, too much sugar and too much salt. But I’ve found Heinz makes a low-salt ketchup and a low-sugar ketchup, so I bought both and use a tablespoon of each to get reduced sugar and salt. I had onion slices for more flavor as well. I’ve also found an organic ketchup at Whole Food and online at Amazon that is both low salt and low sugar and have been buying that 12 bottles at a time. I also recently discovered another supermarket here, Dominick’s which is owned by Safeway, has 93 percent lean ground beef, so I plan to try that as well.